If you're looking for container garden ideas, inspiration abounds, whether it's on television shows or websites or in glossy magazines or books. Container gardens are limited only by your imagination, budget, and weather conditions. One of the benefits of container gardens is the ease with which you can change them. Spring container gardens give way to summer and fall delights. By choosing different plants each season, your container garden can look fresh and new with each season. In the early spring, you're probably hungering for a shot of color and a bit of fragrance. Try the following flowers that can take cold weather and shrug off frosts in early spring. 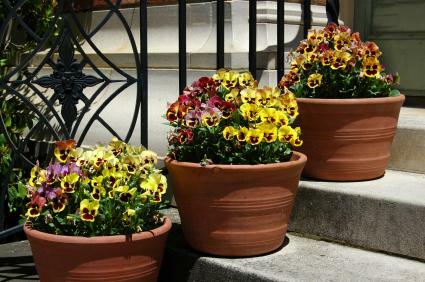 Pansies: Plant pansies in containers by themselves or mix them with other spring annuals. Choose a single color for a monochromatic look or complementary colors, such as dark purple with bright yellow, for a dramatic statement. Stocks: Stocks are annual flowers that can take cold weather. They have a strong scent akin to carnations or cloves. Place these taller flowers near the center of the container and ring pansies around them, or plant them in window boxes for a bold look. Dianthus: Dianthus are another spring flower that makes a good container flower. Their bright, disk-like flowers come in shades of white, pink, and dark pink. Use them by themselves or mix with pansies and stocks. Bulbs: Many garden centers offer tulips and other spring blooming bulbs already started in pots. You can slip these into your garden containers and plant pansies around them for instant spring color. Container garden ideas for the summer months range from bold statements to using your houseplants as temporary container garden plants. The key to choosing container garden plants for summertime pots is to choose plants well-suited for the area where you will place your containers. Sunny areas: Bright, full sunlight offers many possibilities, but don't forget that along with full sun comes scorching heat. Try flowering annuals that can take hot conditions, such as portulaca. Geraniums make super container gardening plants and are fairly drought tolerant, even tolerating some partial shade. Petunias look lovely cascading over the rim of container gardens, and you can find many more ideas at your local garden center. Shady areas: Don't despair if only shady areas are available for your container garden. Impatiens are summer flowers that love shade. You can make a lovely container garden using greenery such as dracaena, with tall, spiky fronds, set in the middle of a container, ringing impatiens and white bacopa around the rim of the pot. Houseplants: One trick experienced gardeners use for container gardening ideas is to place houseplants, still in their original pots, inside a fancy container outside during the summer. If you need to raise them up slightly, use Styrofoam or packing peanuts, which add height without weight and allow water to drain from the pots. Place the houseplants in a pleasing arrangement and use sphagnum moss around the top of the container to hide the pots. When fall comes again, remove the moss and bring plants back inside. As the cool weather approaches, you can get more mileage from your containers by replacing tired summer flowers with fall delights such as ornamental kale, ornamental cabbage, pansies and chrysanthemums. Try planting mums in your container and place a few ornamental miniature gourds around the pot for a nice autumn touch. Ornamental kale and cabbage should keep their color and attractive appearance throughout the winter months. If, however, they start to fade, you can always remove them and slip a nicely trimmed evergreen shrub into the pot. Such evergreens may be decorated for the holidays too. Artificial greens and artificial poinsettias also add a holiday touch to containers. Do not place real poinsettia plants outside unless you live in a tropical environment or very warm area; cold weather can kill them. You'll never have to wait for planting season again once you discover the joys of container gardening. Use these ideas, and check out other lists of cold weather plants and flowers you can use to create attractive container gardens year-round.